Many of the people who may wish to spend a day or two in a place such as Graaff-Reinet will want to reserve their cash to pay for souvenirs or, given the excellent nature of Karoo cuisine, on dining out at some of the fabulous eateries that continue to surprise the new visitors to this picturesque and historic Eastern Cape town. In such cases, one of the best ways in which to economise is to look for the most affordable accommodation that is available. Cheap tariffs, however, can often mean meagre facilities and a sparsely furnished room that serves no function beyond providing shelter, a bed, and basic ablution facilities. While for some, this may be acceptable, often; tourists and holiday-makers tend to prefer a little more comfort, especially at the end of a busy day spent in exploring the town and its surroundings. For them, a more acceptable means to limit their expenses might be to forego the option of a full breakfast, room service, and similar extras and to settle for a self-catering guest house. In a town such as Graaff-Reinet, there is so much to be seen and enjoyed. Despite its limited size, this fourth-oldest South African settlement is a veritable treasure chest of history that tells of the earliest days of the Cape Colony and the battles fought between settler nations vying for its control, of conflict with the indigenous people, of a town once briefly proclaimed as an independent Boer republic, of two bloody wars, and of the Great Trek into the interior and across the Vaal River. Viewed from the heavens, it is an oasis nestled in the bend of the Sundays River and the foothills of the mountain known as Spandau Kop and surrounded by a region of the Great Karoo now a national park, rich in indigenous flora and fauna and some the most fascinating an unusual scenery in the country. Nobody who visits Graaff-Reinet should think of leaving without first pausing to experience the vast Camdeboo plains and the extraordinary geological formations that serve to make the Valley of Desolation appear as the alien landscape of some hostile and distant world that belongs to science fiction. All of this means that an overnight stay will never be enough and given that the town offers comfortable and affordable accommodation that most would regard as luxurious, there are many good reasons to extend one’s visit and to savour the unique sights and experiences that continue to draw thousands of visitors, both from overseas and South Africa. 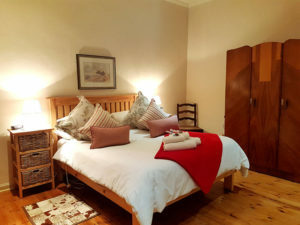 Combining the advantages of a surprisingly reasonable rate with facilities seldom seen outside of a 5-star hotel, the self-catering guest house KarooRus lives up to its name, providing travellers to this quaint and historic Karoo town, with a haven of rest. Security with off-street parking and private, alarmed entrance, and air-conditioned rooms decorated, furnished, an equipped to the highest standard, fitted kitchenette, and DStv provide luxury enough. KarooRus is located just a stone’s throw from some of the town’s world-class restaurants, many served by award-winning chefs, offers luxury with the added benefit of convenience and this affordable accommodation is a favourite with so many visitors to Graaff-Reinet. Despite the world-class shopping experience to be enjoyed in the modern malls that typify the upmarket suburbs of Johannesburg; the lure of the beaches that attract so many to Durban’s surrounds; or the magnificent views from Table Mountain whose slopes dominate the mother city, it is a quaint little settlement in the midst of the Great Karoo that has earned the accolade of best town in South Africa. The title is well-deserved. In addition to this latter-day celebrity status, Graaff-Reinet holds the further distinction of being the country’s fourth oldest town, predated only by Cape Town, Stellenbosch, and Swellendam. Established initially as a defensive outpost, in common with its predecessors, its ownership was constantly in contention alternating between the Dutch and British settlers and later between the British and the Boers, sometimes through conflict and sometimes by contract. The result is that this Eastern Cape Midlands town has a packed and colourful history. The evidence of this is everywhere and can be seen in its museums and well-preserved buildings with their characteristic architecture. In practice, the town itself acts as a living museum, its faithfully restored structures reflecting the lives of those who established and fought over the Cape Colony. Today, the many guest houses now scattered through the streets of Graaff-Reinet are the evidence of a unique tourist experience that has proved fascinating to visitors from all over the world as well as from all corners of South Africa and breathed new life into the town. It is, however, not just its history and architecture that draws so many to the town. Its location in the heart of the 15 000-ha Karoo Nature reserve, with its diverse flora and wildlife creatures that include the Cape mountain zebra, provides an additional attraction. Nearby, hiking trails lead to viewpoints from which to overlook the Camdeboo plains and the town below, or the other-worldly spectacle of the twisted columns and impossible rock piles that litter the aptly-named Valley of Desolation. When a busy day of taking in the Karoo scenery, visiting the town’s historic monuments and its fascinating museums have left you hot and hungry, your first need will probably be to pop back to your room to take a shower. For those with a taste for luxury and who want to be close to the action, Graaff-Reinet offers the perfect solution in the form of the luxury guest house named KarooRus. The ultimate in self-catering accommodation, KarooRus consists of a beautifully restored building in the traditional Cape Dutch style and divided into seven self-contained units including a flatlet for 4 as well as units to sleep 2, 4, and 6 guests, each with its own private entrance. Secure parking, stylish décor, top-quality fitments and furnishings, a modern kitchenette with all essential appliances, and DStv make KarooRus an exceptional hostelry while its affordable rates make it the ideal family choice. 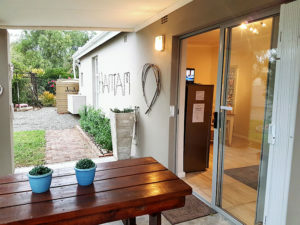 For those occasions when one may not feel like cooking, the accommodation is just a short stroll from some of the finest restaurants in the country and a unique chance to sample the superb cuisine of the Karoo prepared in the kitchens of award-winning chefs. For the best possible Graaff-Reinet experience, be sure to make KarooRus your guest house of choice.